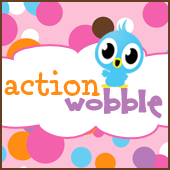 Action Wobbles: Action Wobble: Say Cheese! It is Gloria from Girlia's Cards once again to share a card with you. Thanks again for taking the time to take peek at this card...wait for it-- wait for it--a camera on an action wobble! A moving camera is definitely fun on a card!